The single most exciting part of Christmas for me is decorating the tree. Most of November consists of me waiting for any sign that's it's appropriate to bring the tree out. This year our neighbours put up their Christmas lights really early, and that was all I needed. I eagrly grabbed the tree and set about my favourite task. No one else in my family is really into any artistic hobbies or creatively inclined, so even when I was quite young they were more than happy to let me decorate the tree. To everyone else, it seemed like a chore. It eventually became my 'thing' at Christmas. As a kid I'd become easily bothered if people tried to 'help', because it would inevitably result in them putting decorations in places that were just aesthetically horrible. These days, my boyfriend always helps me decorate the tree. While he jokes about how pedantic I am about it and teases me about my decorating 'rules', he shares the same creativity and an eye for detail that comes with his love for artistic hobbies. He's just a pedantic as me, and the only person I trust to help me with this onerous task. 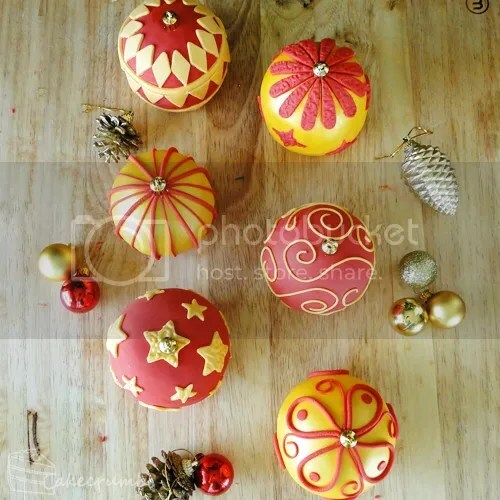 It was really evident this year when we were finding places for the last handful of baubles. My sister suggested a place for him to put the one in his hand and he replied with, "No, you can't put it there. 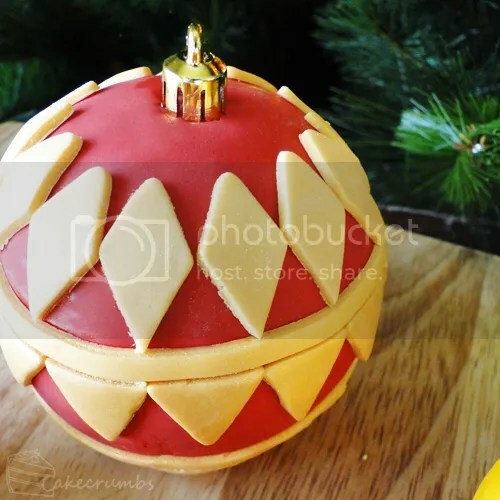 There's another bauble of the same size and colour right there." That's my boy! As I grew up, every year I'd have a different theme. Out decorations were a haphazard collection of brand new assortments of baubles alongside ratty old ones from the 80s. I'd pick and choose colours every year, with one of my favourites being red and gold. These days, my tree is always blue and silver. I've built up quite the collection of blue and silver decorations now, a collection large enough to fit the ridiculously over-sized Christmas tree. While blue and silver is my chosen poison these days, I miss the red and gold a little. 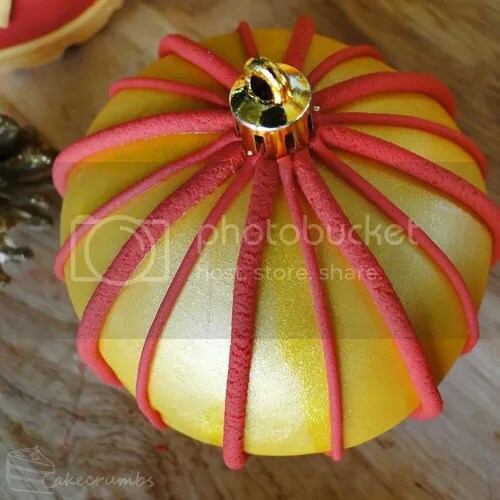 I almost have no red and gold baubles left any more, so it was with immense joy that I returned to one of my favourite colour schemes with these edible versions. I've been absolutely flat out in the kitchen, so I've been forgetting to take proper progress photos of everything. But these cakes are cooked in a half-sphere silicone pan I picked up a little while ago. It's apparently meant for savoury dishes but hey, I'm not about to let some box tell me what to use my baking equipment for! Once baked, I joined the two half spheres with a layer of buttercream, then gave it a quick crumb coat before adding the fondant. All up there are 6 baubles. I gave each a different design because apparently I love to torture myself. 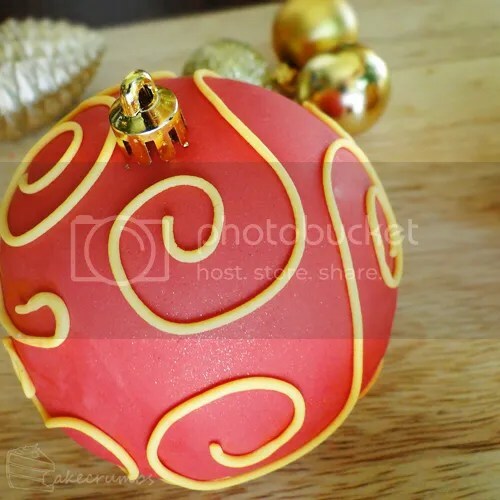 These allowed me to practise covering spheres with fondant for the first time. I can tell you that it was definitely not easy! These seriously lacked finesse. It's definitely something I'm going to have to find more excuses to practise. 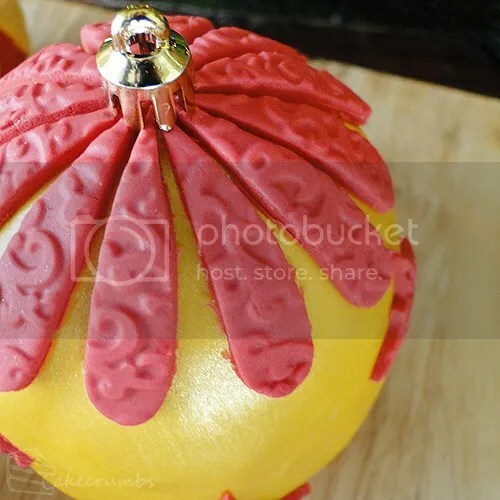 I coated half of them with red fondant and adorned with gold decorations. 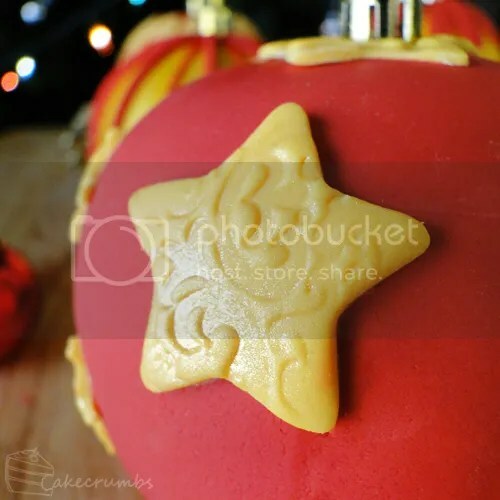 The first had embossed gold stars. The last three I covered in gold fondant, then coated painted with a lustre dust mixture I made up. Once that dried, I started adorning those with red embellishments. My sugar gun got lots of use today, that's for sure. By the end I was getting really lazy and racing the sun to get these finished in time to photograph. 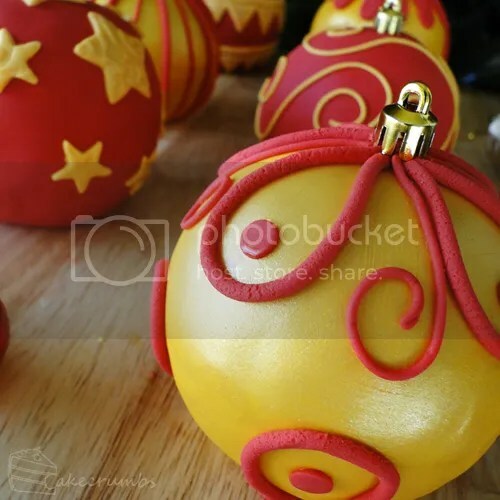 So instead of fashioning caps for them and waiting for the gold to dry, I pinched some from the unused baubles in my stash to adorn the tops of them. 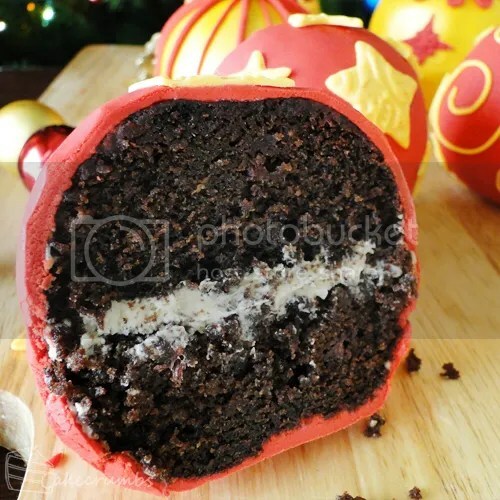 Inside the baubles is a dark chocolate and raspberry cake. I would be more inclined to use a less moist cake next time I make these. At the very least, omit the raspberries as any that bake near the surface cause indentations. 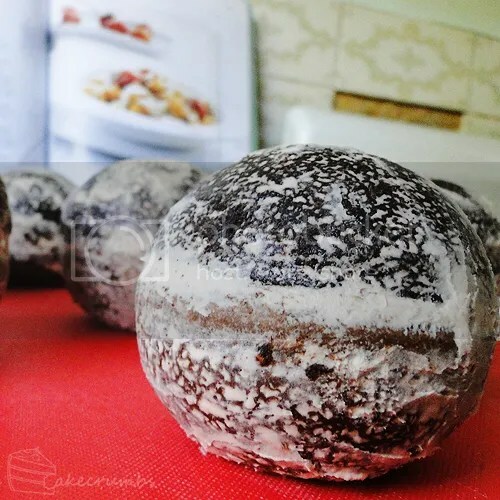 While it added to the difficulty of creating a perfect sphere, if you have zero intentions of making a spherical cake then by all means dive into this recipe. If you love the bitterness of dark chocolate, or that boozy type of Christmas cake, you will love this. There's no alcohol in it at all, but the combination of dark chocolate and raspberries might fool you into thinking so. Especially if you are like my family who seldom has any alcohol, let alone food containing it, so the taste was very striking. Here's a recipe for a cupcake version. Preheat oven to 170­°C (150° fan-forced). Line a cupcake tin with patty pans. Combine dark chocolate and water in a small pan; stir over medium heat until smooth. remove from heat and set aside. Beat butter and sugar together until light and fluffy; beat in eggs one at a time until combined. Fold in sifted flour, cocoa and almond meal; stir in chocolate mixture then raspberries. Divide mixture among pans; bake for 45 minutes, or for 55 minutes if using a larger-sized tin. Leave to cool in tins for 10 minutes; transfer to a wire rack to cool completely. Ice and/or decorate if desired. Thank you. :] It is quite a busy time of year! 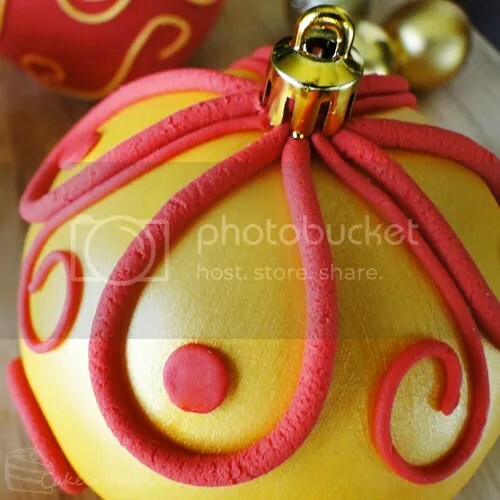 That is a whole bunch of amazing ornaments. I don’t think I could make anything like that at all. Thank you. :] Fondant does take some practise to work with, but you could definitely do it with practise. A little over 3 years ago, I didn’t even know what fondant was! It isn’t the fondant so much as the fact my artistic abilities are about nil. grin.